Claim: The Benghazi incident represents a once-in-a-generation tragedy in which a consulate was overrun and help, which was in large supply, was intentionally withheld (including a stand down order). This refusal of help goes all the way up the chain of command. Fact: The Benghazi incident is a tragedy but is one of the countless attacks on US diplomatic structures. What little help was available (which was slightly delayed for the sake of ensuring they weren’t walking into an ambush) was sent within 30 minutes of the attack. Eight separate investigations have been conducted, most of them merely confirming what the previous investigations concluded: that a lack of preparation is largely to blame, but there was no foul play nor refusal to send help. Existing allegations range from demonstrably false internet rumors (that air support was available) to the usual logical fallacies (like the hindsight bias of assuming that the State Department should have known the Benghazi attack was imminent, even though there were threats of attacks on multiple locations). The Benghazi saga appears to be at heart, a political movement. On September 11th, 2012, an American diplomatic mission in Benghazi (Libya) was attacked by over 150 armed gunmen. As a result, four Americans were killed and several others injured. With a presidential election only 2 months away, this became the basis for political attacks, spawning names like “Benghazi Gate” and rumors that included alleged stand down orders that prevented reinforcements from intervening; some even stating that Obama and few others watched live feeds of the attack unfolding. Both of these were based on unconfirmed hearsay, yet was repeated across right-leaning news sources as fact, leaving many on the right to claim that the “MSM” (news sources that generally avoid broadcasting unverified rumors as fact) was assisting in a cover-up. Since these events occurred, several independent investigations have clarified the events that took place that night. While these reports conclude that the State Department could have been far more proactive in beefing up the thin and questionable security at the Benghazi embassy, the various conspiracy rumors have been answered and quelled. Nevertheless, the idea that the Benghazi event is the source of a grand cover-up persists along predictable partisan lines in part due to the continuing publication of arguments that have long been addressed in the various Benghazi investigations. Fox News editorialized an unverified and anonymous statement that stand down orders were given (this was proven to be false, once it was known that CIA operatives arrived on the scene in less than 30 minutes. The closest thing to a “stand down” order was an order to await more intelligence before allowing Paronto and his team to depart (this is largely the basis for the 13 Hours movie, whose narrative is at odds with the findings of the various Benghazi investigations. While this incident should not be downplayed by any means, it is not the first of its kind. Over the last 20 years there have been many such attacks, some with even worse outcomes than the Benghazi incident. Why has Benghazi been so publicized while others (11 of which happened under George W Bush) have gained very little attention? Probably because this one was 2 months before a presidential election (one in which many members of the opposition party had no qualm with publicizing rumors and misquotes). Again, the events that happened on 9/11/12 should be downplayed, but at the same time, they should not be treated as a once-in-a-lifetime anomaly. Attacks like these have been more frequent than most people seem to realize. Journalist Tom Ricks lays out this context when interviewed by Fox News. This claim (made by an anonymous source and publicized by Fox News) has been debunked since the early reports from the CIA (which arrived on the scene within 30 minutes). It also been debunked by the various independent reports. This has been disproved by the fact that assets were deployed. A CIA rescue team was on the scene within half an hour of being contacted. According to the Senate Select Committee on Intelligence Report (PDF), Secretary of Defense Leon Panetta ordered two Marine Fleet Antiterrorism Security Teams (or “FAST platoons”) to deploy from their base in Rota, Spain, to Libya, as well as two teams of special operations forces to Benghazi. But these forces arrived too late, as Americans had already been evacuated by previously deployed the CIA teams. The claim that AC-130’s were available during the Benghazi attack likely stems from the fact that such planes were available in Libya 18 months prior. It has been verified however, that these planes were not available on September 11, 2012. 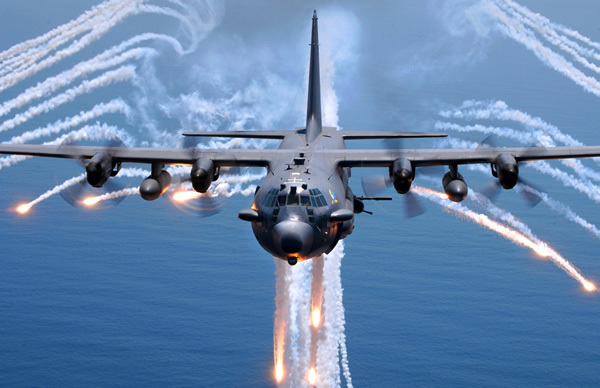 There is a misconception that AC-130’s were available within Libya during the Benghazi attack. While it’s difficult to pin down the original sources of this claim (for example, a Breitbart article makes certain claims based on what “reports say,” without mentioning the name or source of the report(s). The assumption that AC-130’s were available likely stems from the fact that these aircraft did play a role in Libya under Operation Odyssey Dawn in March of 2011, and the originators of this claim are merely assuming that the AC-130’s were still in Libya 18 months after Operation Odyssey Dawn. Ambassador Thomas Pickering, Chair of the Benghazi Accountability Review Board (who also investigated the Benghazi incidents (see the ARB’s report (PDF)), answers questions regarding the availability of US assets at the time. Related to this is a misconception that Obama himself was not in communication. But Leon Panetta’s testimony states that he was in contact with Obama soon after being informed of the attacks. Obama instructed Panetta to attack with “all available DOD assets.” Whatever one thinks of the response time of US forces, Americans were evacuated from the embassy and, along with the CIA Chief of Station, flown to safety. Another common mischaracterization of this event goes something like “Four Americans are dead and nobody did anything about it.” The belief here is that 4 Americans were simply left for dead, while no one helped. But in fact, two of those four Americans (Glen Doherty and Tyrone S. Woods) were part of the security team who mounted a rescue and led an evacuation of the compound. In the aftermath of these attacks, there appears to have been some confusion/disagreement over whether this was a planned terrorist attack or a sporadic response to a video that many Muslims found insulting. Many on the right have criticized the Obama administration for labeling these attacks as a response to the video, as opposed to a planned terrorist attack (thereby not having to deal with the political fallout of a terrorist attack on his watch, 2 months before an election). While it is entirely possible that the Administration was purposely going with the politically expedient explanation of a sporadic reaction to a video, there is ample evidence that the Intelligence Community itself was confused over which of these were correct. The SSCI and HASC reports appear to arrive at slightly different conclusions in regards to how well informed politicians should have been regarding the lack of protests. The SSCI report focuses on the Intelligence Community’s own fumbling of facts and misinterpretations (implying that the confusion among politicians at the time was understandable), whereas the HASC focuses specifically on General Ham’s own immediate belief that these attacks were planned and not a reaction to the YouTube video (implying the opposite–that politicians should have known better). In the immediate aftermath of the attacks, the IC received numerous reports, both classified and unclassified, which provided contradictory accounts that there were demonstrations at the Temporary Mission Facility. In some cases, these intelligence reports-which were disseminated widely in the Intelligence Community–contained references to press reports on protests that were simply copied into intelligence products. Other reporting indicated there were no protests. As a result of evidence from closed circuit videos and other reports, the IC changed its assessment about a protest in classified intelligence reports on September 24, 2012, to state there were no demonstrations or protests at the Temporary Mission Facility prior to the attacks. This slow change in the official assessment affected the public statements of government officials, who continued to state i_n press interviews that there were protests outside the Mission compound. It is also worth noting that violent protests to the video were erupting throughout the Muslim world at this time, further adding to potential confusion. In retrospect it appears pretty obvious that more could have been done to address the thin security at the Benghazi embassy. However, the assumption that the State Department should have known that an attack would happen specifically in Benghazi is an example of hindsight bias. Banghazi was only one of nearly 300 areas of concern. 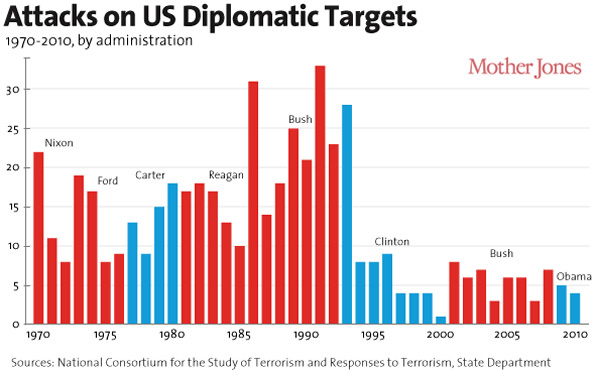 In the six months leading to September 11th, 2001, there were 281 threats to diplomats, embassies, diplomatic facilities, consulates, etc worldwide. According to the report of the ARB, “there appeared to be very real confusion over who, ultimately, was responsible and empowered to make decisions based on both policy and security concerns” at the State Department’s Bureau of Diplomatic Security, Bureau of Near Eastern Affairs, the U.S. Embassy in Tripoli, and the Mission facility in Benghazi. Furthermore, the ARB report pointed out that certain security upgrades were implemented (even if they were insufficient in retrospect). It is incumbent upon the Board, however, to acknowledge that several upgrades and repairs took place over 2012. DS provided additional funding for the Local Guard Force (LGF), February 17, and residential security upgrades, including heightening the outer perimeter wall, safety grills on safe area egress windows that helped save the life of ARSO 1 on the night of September 11, concrete jersey barriers, manual drop-arm vehicle barriers, a steel gate for the Villa C safe area, some locally manufactured steel doors, sandbag fortifications, security cameras, some additional security lighting, guard booths, and an Internal Defense Notification System. This misquote had become an internet meme in itself. To anyone watching the Benghazi hearings the (actual) quote “What difference at this point does it make?” was rather benign, given that Clinton was addressing the wider and more important issue of the dead Americans, and suggesting that the focus on the reason for the attack was a misallocation of priorities. Nevertheless, this misquote has been passed around (along with other leading “Hillary Benghazi fact”) as if Hillary Clinton was asking “What difference does [the Benghazi incident] make?” and this is clearly not the case. As unfortunate as his incident was, the “Benghazi scandal” appears to be one of the latest of many attacks on American diplomatic outposts. The conspiracy/cover-up claims have been debunked, though stronger security measures would have been a help. What the proponents of the idea that this was some intentionally negligent or outright ignored problem have yet to explain the upside to “allowing” this attack to take place. Predictably, this has obviously been a losing scenario for both Barack Obama and Hillary Clinton. The idea that they would intentionally allow this to happen makes little sense. The argument that Barack Obama and Hillary Clinton would intentionally stifle an effective response seems at odds with their future goals. Barack Obama was in what appeared to be a tight race for reelection and Hillary Clinton was likely contemplating her eventual presidential bid. Neither had anything to gain and both had much to lose from this tragic event. There was also the interesting “Benghazi Watchdogs” group which stirred controversy for fundraising off of the incident. On September 11th of 2012, the United States diplomatic facility in Benghazi, Libya came under attack. At 9:40 p.m., gunmen stormed the compound, pushing back both U.S. and Libyan security forces and trapping U.S. Ambassador J. Christopher Stevens in the main building. The U.S. staff became divided. Some were pinned down for several hours in one building until a CIA team, collaborating with Libyan soldiers, pushed the militia back. At 10:30 p.m., the militants set the main building of the compound on fire, trapping Stevens and State Department administrator Sean Smith in intense heat and smoke. At 11 p.m., President Obama met with then-Defense Secretary Leon Panetta and chairman of the Joint Chiefs of Staff General Martin Dempsey as an American military drone reached the air above the compound. At 1 a.m., approximately thirty Americans were rescued from the compound by a U.S. force based out of Tripoli. Stevens was rushed to Benghazi Medical Center, where he was pronounced dead. According to the Associated Press news and a doctor on the scene, the likely cause of Steven’s death was asphyxiation from the smoke. At 1:45 a.m., AP news reported the death of at least one American in the assault. At 4 a.m., the Libyan CIA annex came under mortar attack, resulting in the deaths of former Navy SEALs Glen Doherty and Tyrone S. Woods. Two additional service members received injuries. The next day, Sept. 12, 2012, President Obama announced the deaths of four Americans in the attack, including Ambassador Stevens. Like Secretary Clinton, the President reasserted America’s commitments both to peace and to respect for different religions. “While the United States rejects efforts to denigrate the religious beliefs of others, we must all unequivocally oppose the kind of senseless violence that took the lives of these public servants,” he said in a statement delivered from the White House Rose Garden. In October of 2012, Ahmed Abu Khattala, believed to be a major figure in the Libyan militia Ansar al-Sharia was identified as one of those responsible for the attack.